Ask your students what they know about bread and how it is made. Can they name the ingredients in a recipe for bread or rolls? If someone mentions “yeast” as an ingredient, you can guide the conversation from there. If not, introduce the word and a definition. 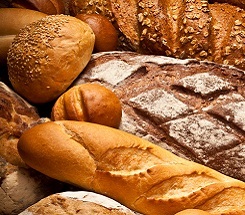 In bakeries and home kitchens, there are several categories of commercial baking yeast available. They are compressed cake yeast, (also known as fresh yeast), active dry yeast, quick-rise yeast, and instant yeast. The scientific name for the active dry yeast, that commercial and home bakers use, is called Saccharomyces Cerevisiae, otherwise known as “sugar-eating fungus.” This is a strong variety of yeast and it is responsible for fermentation. Fermentation is the step when the yeast makes carbon dioxide in the bread making process. For this lesson, tell your students they will focus on the active dry yeast which is available in commercial markets. Two popular companies, who have been producing baker’s yeast for years, are Fleischmann’s and Red Star. Yeast gets energy from its favorite source of food in the form of sugar. This can be pure sugar, honey, molasses, maple syrup, or fruit juices containing natural sugars. The yeast love to be able to eat their favorite sugar in a warm, moist environment where they will multiply in numbers. As the yeast munch away on their sugar, a process called anaerobic fermentation begins to take place. The by-products of this process are alcohol and carbon dioxide. During this time, the carbon dioxide is trapped by a series of strands of gluten in the rising bread. This is what causes the bread dough to rise, or expand on the surface, leaving behind a series of air pockets in the dough. The yeast eventually dies off, from the heat when baking, and any remaining alcohol evaporates. The air pockets left behind are what give baked bread its crunchy goodness. Tell your students to rip apart their bread now, and identify the air pockets that formed when the bread was baked. Active dry yeast comes in packets, and the dry granules are the size and color of sand. Yeast packets will be marked with an expiration date, but it has a decent shelf life in a kitchen cabinet, making it a favorite product for home bakers. Tell your students the science they will take part in is a process called “proofing” the yeast. This means they will “feed” the yeast its sugar source and watch the yeast start to go through the fermentation process in a glass. The following activity calls for a few items including some packets of yeast. Share with your students that this is a test many bakers use to make sure the yeast is still active before proceeding with a recipe. Ask your students to observe the scent of the yeast, as it mixes with the warm water and sugar in a glass. It already smells like the aroma of bread being made! -Add sugar and gently stir. -Mix the same yeast mixture and pour into a bottle. -Fit a balloon on the opening of the bottle and set aside.